As I try to look ahead to the blessings, hopes and opportunities of another new year, I start by looking back a bit. In recent weeks, I have found a few leads to stories on various individual soldiers, their service and their lives. I have posted a couple and am working on others. These stories take longer to research, write and proofread than transcribing an article, offering opinions or reviewing a book, but also tend to be more enjoyable and even more educational to me. Not only do I learn their individual stories, but it helps me realize just how many different people were involved in the war, he many lives were affected, how many personal narratives occurred. That seems like a fairly obvious point, but finding and telling these tales, each one different, really drives that home for me. It really is different to write such entries instead of just reading somebody else's work. I guess it's a feeling of ownership, with perhaps a developing sense of familiarity with the subject. Hopefully I can find more such projects as the new year proceeds. 2015 was a good year for the blog, I believe, especially the last few months. I am happy with several research projects I finished, such as the posts on John Rankin and John Parker, the study on the George Grey Barnard statue of Abraham Lincoln and the connection I found between a Kentucky basketball player and the Civil War. My hope is to continue to find such interesting stories and to be able to do more such research and writing. Anyway, 2016 is now here and perhaps even a history blogger should take time to look forward. I have some good research already started and hope it continues to progress nicely. I would like to average at least one post per week (though I will try to avoid posting just to say I met some quota.) I cannot know for sure where my obsession will go during this year, but am ready to find out what stories pop up and what ideas fill my mind along the way. Family history in the war will likely be one topic I continue to explore, as will the roles of Kentucky and the Cincinnati area in the conflict. Hopefully I can take the time to make some short trips (Perryville, Richmond, Ky., Mill Springs are possibilities) and offer perspectives on those or other places. Reading more books and reviewing those books are other goals I would like to accomplish. Well, that's enough for now. As always, time itself will tell how things go. 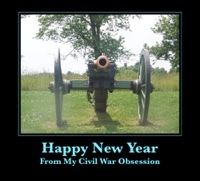 Happy New Year to all who visit and read this blog. I thank you all for your support and wish you the best in 2016 and beyond.